The Lincoln catafalque is a platform constructed in 1865 to support the casket of Abraham Lincoln while the president's body lay in state in the U.S. Capitol Rotunda. It is a simple base of rough pine boards nailed together and covered with black cloth. The Lincoln catafalque in 2006, after the most recent replacement of its fabric covering. Although the base and platform have occasionally been altered to accommodate the larger size of modern coffins and for the ease of the attending military personnel, it is basically the same today as it was in Lincoln's time. Presently the catafalque measures 7 feet 1 inch (216 cm) long, 2 feet 6 inches (76 cm) wide and 2 feet (61 cm) high. The attached base is 8 feet 10 inches (269 cm) long, 4 feet 3-1/2 inches (131 cm) wide and 2 inches (5 cm) high. The platform is 11 feet 1 inch (338 cm) long, 6 feet (183 cm) wide and 9-1/4 inches (23.5 cm) high. 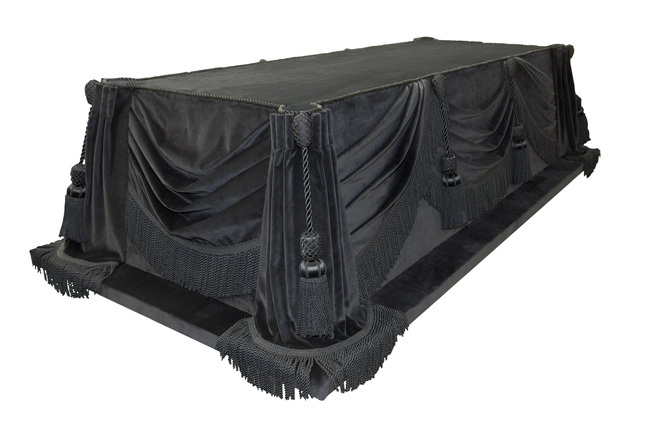 The cloth covering the Lincoln catafalque has been replaced several times, but the style of the drapery is similar to that used in 1865. Since 1865, it been used for most of the services in the Rotunda. In the case of the Unknowns of World War II and the Korean War, an additional catafalque was built with the coffin of each at some point resting on the Lincoln catafalque. The Lincoln catafalque has not been used for those lying in honor: the Capitol Police officers in 1998, Rosa Parks in 2005, Billy Graham in 2018. For more information, please see the full list of those who have lain in state or in honor in the U.S. Capitol Rotunda. Senators and representatives have also lain in state on the Lincoln catafalque elsewhere in the U.S. Capitol. It was used in 1873 in the Senate chamber for the services of Chief Justice Salmon P. Chase and in 1875 in the House chamber for Congressman Samuel Hooper. And in 1996 it was used for the lying in state of Secretary of Commerce Ronald H. Brown at the Department of Commerce building. When not in use, the Lincoln catafalque is kept in a specially constructed display area in the Exhibition Hall of the Capitol Visitor Center.